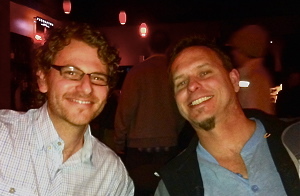 Tapspace is driven by Jim Casella and Murray Gusseck. Jim and Murray are probably best known for their work with the Santa Clara Vanguard Drum and Bugle Corps (SCV) in the 1990's and 2000's. During this time, they helped shape percussion music that influenced the art form in new ways. They also shared a cubicle at Apple Computer working as QA engineers for a brief stint. Quickly realizing they didn't necessarily want to become entrenched in a corporate job, they decided to put their collective computer skills to use in creating and publishing creative percussion music. Aside from their background in rudimental percussion, Jim and Murray have both maintained active careers as professional percussionists and composers. We publish percussion sheet music, educational resources, and sample library software to serve the needs of music educators who are passionate about creativity and like good music as much as we do. When did we start all of this? One day in 1998 while living in San Jose, CA as roommates, Jim asked Murray, "Hey dude, do you want to start a publishing company?" Murray responded, "Sure, why not?" With a combined weight of approximately 370 pounds, Tapspace was born. We started by publishing some of the drumline music we were writing for SCV at the time. With our schedules being so busy with touring, performing, teaching, and writing, Tapspace was more of a hobby than a full time job in those days. We were just excited to have an outlet for our writings, and luckily people seemed to dig what we were doing! Around 2000, we began to diversify by publishing the works of other talented composers and adding concert percussion ensembles to our catalog. In 2003, we released the first rendition of the groundbreaking "Virtual Drumline" sample library, which soon revolutionized the way composers and arrangers integrate percussion sounds into their compositional process. Since then, VDL has become a household name in music education, and our sheet music catalog has grown by leaps and bounds. Our star-studded list of published artists are some of the best in the business, and our music is now being performed daily across the globe. Needless to say, Tapspace has since become a full-time operation! We're based in the beautiful and forward-thinking city of Portland, Oregon. You should visit Portland and ride a bike around. The air is clean, and the beer is good. If you can't make it, you can always find us here at Tapspace.com. It's our home away from home. We do what we do because we love music—plain and simple. Tapspace has grown because of the genuineness that shines when good people put their best foot forward to make something great. It also means we've had to learn to wear many different hats. On any given day, we might be music engravers, composers, editors, proofreaders, graphic designers, web designers, IT professionals, accountants, customer care associates, administrative assistants, tech support providers, janitorial engineers, travel agents, and occasional party planners. We care about the details and take great pride in our work. For this reason, we go for the personal touch in all that we do. You're inspired by good music, and it drives you to push the envelope as a performer and/or teacher. You love technological goodies and are excited by the potential of technology in delivering musical ideas and products. Your support of these things is the reason we are able to do what we do. We certainly wouldn't be where we are today without your help, support, and gentle nudges in the right direction. For this, we sincerely thank you.